Justice Murray is a native Californian, born in Tulare in 1957. He graduated from Frostburg State College (now Frostburg State University) in Maryland in 1979 with a double major in political science and economics. He earned his law degree from George Washington University in Washington, D.C. in 1982. From 1982 to 1986, he served as a prosecutor in the Office of the Kings County District Attorney in Brooklyn, New York. In 1986, he moved back to California and began service as a prosecutor in the Office of the San Joaquin County District Attorney. From 1992 to 1995 he served as second in command in that office. He was appointed to the San Joaquin County Superior Court in 1995 by Governor Pete Wilson and to the Court of Appeal, Third Appellate District, in 2010 by Governor Arnold Schwarzenegger. While sitting on the bench in San Joaquin County, Justice Murray presided primarily over criminal cases, but also handled civil law and motion and a variety of other matters. 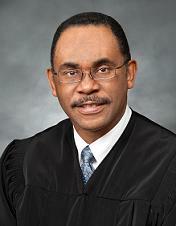 He served as assistant presiding judge from November 2005 through December 2007 and as the court's presiding judge from January 2008 through December 2009. Known for his community outreach activities, he was a cocreator of the San Joaquin County Superior Court’s innovative and award-winning Court-Community Leadership & Liaison Program. He was also a cocreator of that court's award-winning Jury Compliance and Education Program. Motivated to educate youth about the courts and to interest them in justice system careers, Justice Murray has participated in many youth outreach programs. He has also been involved in jail and prison outreach programs designed to curb recidivism and to motivate the children of incarcerated parents to succeed in life. In 2003, while still in the trial court, Justice Murray was appointed by California's Chief Justice to a three-year term on the California Judicial Council. The Chief Justice appointed Justice Murray to a number of leadership positions on the Council, including Vice-Chair of the Executive and Planning Committee and Vice-Chair of the Rules and Projects Committee. Toward the end of his term on the Council, he also served for a short period as Chair of the Litigation Management Committee. In 2005, he served as the chair of the oversight committee for the first statewide conference jointly sponsored by the Judicial Council, the California Judges Association and the California State Bar. After leaving the Judicial Council, the Chief Justice appointed him to serve on the Commission for Impartial Courts Retention and Selection Task Force, as well as the Commission's Steering Committee. Justice Murray is a former co-chair for the California Bench-Bar Coalition. He is also a former co-chair for the Joint Working Group for Jury Management and Administration, a working group of the Trial Court Presiding Judges Advisory Committee and the Court Executive Officers Advisory Committee. He is a former member of the Judicial Council's Criminal Law Advisory Committee and the Task Force on Jury System Improvements. Appointed by the Chief Justice, he currently serves on the Judicial Council's Advisory Committee on Access and Fairness and the State Bar’s Legal Services Trust Fund Commission. He also serves as the chair of the Third District’s Outreach Committee. In 2013, he coordinated the court’s Let Freedom Ring program at the California State Fair. He continues to be involved in school outreach activities. Justice Murray has served as an instructor for judicial education programs since 2002. He is the author of and consultant on resource materials on jury issues used by judges statewide. He served as an adjunct professor at the Laurence Drivon School of Law at Humphreys College in Stockton between 2002 and 2009. He is a member of the Judge Consuelo Callahan Inn of Court in Stockton, California and has been a team leader for two programs that won national Outstanding Program Awards from the American Inns of Court, a national organization that fosters excellence in professionalism, ethics, civility and legal skills. Justice Murray is a current board member and former board president of the Stockton Collegiate International Charter Schools. He is a past board member at Humphreys College and the Stockton Boys and Girls Club. He served on the San Joaquin County Law Library Board from 1997 through 2000, the last two years as board president. Justice Murray has received the following honors: 2013--Stockton Branch NAACP Freedom Fighter Award; 2013--Wiley Manuel Bar Association Judge of the Year; 2011--California Black Lawyers Association, Judicial Section, Distinguished Judicial Officer Award; 2008--San Joaquin Black History Month Award; 2007--California Bench-Bar Coalition Judicial Officer of the Year; 2004--California Association of Leadership Programs Distinguished Leader Award; 2003--Mediation Center of San Joaquin Peacemaker of the Year; 2002--San Joaquin County Bar Association Law Day Award; 2002--Rev. Benjamin L. Hooks Award; 2000--Stockton Branch NAACP Community Impact Award; 1990--recognized as one of California's "Most Effective Prosecutors" in the California Lawyer (Oct. 1990) p. 41; 1979--Frostburg State College John Allison Outstanding Senior Award (President's Award); 1979--Frostburg State College Political Science Departmental Award. Justice Murray has been married since 1985. The couple has two children, a daughter and a son.